The world can be a seriously crazy place. And, nowadays, we have this instant gratification/lack of patience thing going on in our lives. I know more people with anxiety and stress than I do people who don't have either of those things. Nowadays life is all about the fastest way we can do whatever we need to do. We've become a society of “instant gratification” and in our quest to do things faster we've also increased our stress levels. We're so stressed out by daily life and it causes us to have anxiety attacks. The more stressed we are the more our anxiety grows and it's just a vicious cycle that most people don't realize they can stop. I think it's kinda batshit nuts, but that's me and my opinion. If we don't take precautions to lower our stress levels then we're bound to feel some sort of anxiety at one point or another in our lives. But, we can counteract the craziness we encounter on a daily basis. Yoga is really great at helping us to reduce stress and to help relieve our anxiety. Any sort of yoga practice is bound to help alleviate these things, but certain postures help relieve anxiety and stress more than others. Below I've put together a few poses that you can practice as a sequence each day. It doesn't take long, but I would suggest holding the poses for at least 5-10 breaths and even going through the sequence more than once if you have time. 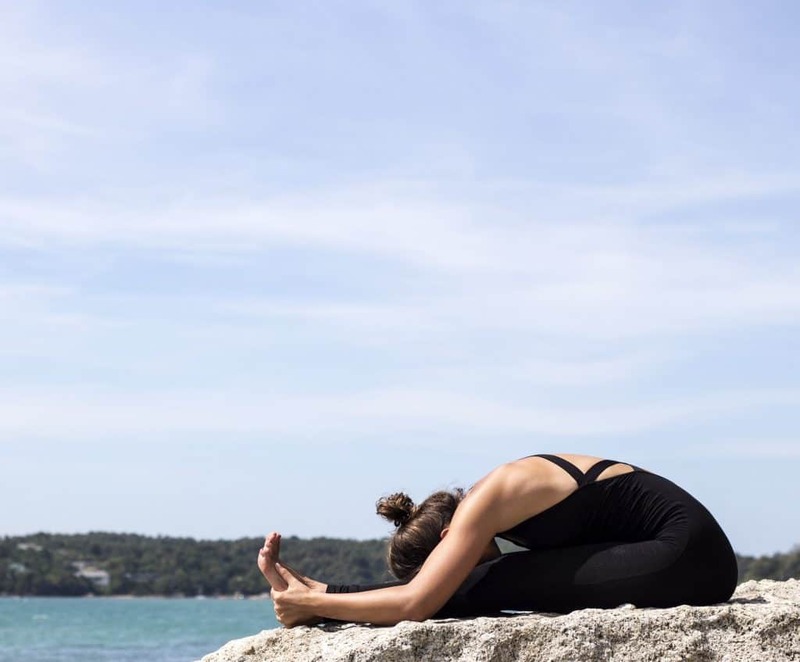 The sequence below has many poses that are both calming and stress relieving. I've chosen these poses mostly for their calming and stress relieving effects and because doing yoga for anxiety is really something I think more people should try. I didn't want to create an invigorating sequence to start out with so that your body has the ability to decrease stress levels before jumping into any invigorating practices. My suggestion would be to read through each pose and then writing down the poses in order (as shown above) so that you don't have to keep referring to this post. Notecards are great for that :). Come to a comfortable seat with your legs crossed in a way that doesn't cause discomfort or pain. Place your hands on your knees, straighten your spine and close your eyes. Try to calm your mind and focus on your breathing. Focus on each inhale and exhale. Remain here for 5-10 breaths to calm your mind and prepare for your practice. From Easy Pose, slowly come onto your hands and knees and then come to standing. Place your hands on your hips and inhale as you straighten further and looking toward the ceiling. On your exhale fold forward and try to place your hands on the ground. If you can't place your hands on the ground I would suggest buying two yoga blocks to help ease your transition. Here are some cork yoga blocks with pretty designs that I really love. Come back to standing with your feet hip distance apart and take a few breaths. Your ability to balance will determine how high you're able to place your foot up on your leg. Start out with your foot on your calf first. If you find yourself stable enough then move your foot up to the middle of your thigh. Never put your foot on your knee though! That will cause injury to your knee. If you're comfortable with your foot on the middle of your thigh then try to put your heel all the way up in your groin area. Remain on each side for 5 breaths. Once you've completed both sides of Tree Pose step your feet apart pretty wide. Rule of thumb is to stretch your arms out to your sides and place your feet under your wrists. That is a good distance. Then twist one foot to the left or right (depending which way you start) and you want to reach your hand out over your foot and lengthen over before you drop your arm down to the ground. If you can't reach the ground you can place your hand on a yoga block to give yourself some room. Remain here for 5 breaths before switching sides. Come to a seated position with your legs stretched out in front of you and your heels together. Sit tall and place your hands down to your sides taking a few breaths before folding. On your last inhale straighten a little more and on your exhale fold forward as far as you can go with a straight spine. You don't want to hunch over or round so you can grab your feet. If you can't reach your feet a good yoga strap or belt will work wonders. On each inhale try to lengthen some more and on your exhales try to fold deeper into the pose. Sit up from your forward fold and come to lie on your back. Bring your feet up to rest just behind your buttocks with your feet spread apart hip distance. You'll want to roll your shoulders/arms under to help you lift your hips and chest towards the sky. When you're rolling your shoulders under you're allowing yourself to open your chest area and to get a really great stretch there. You're also able to lift your hips higher than if your back was relaxed and flat on the ground. 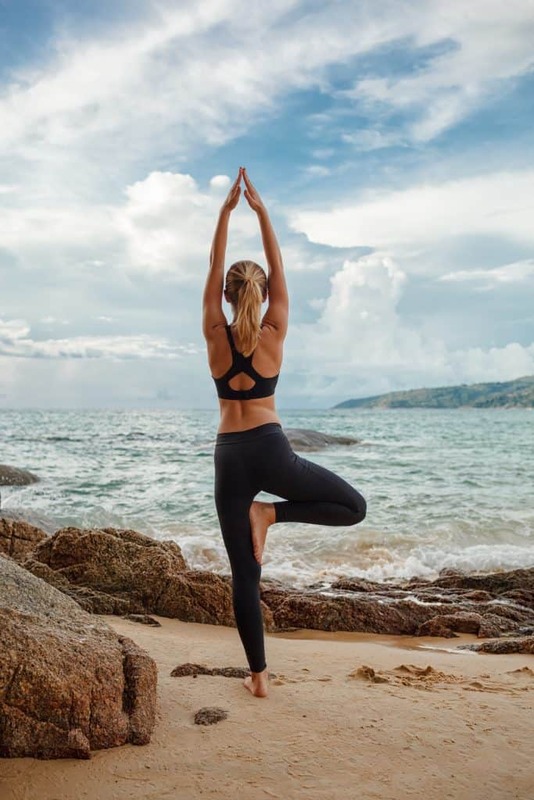 If there was one pose I'd have to choose for you to do each day to help relieve stress and anxiety it would be this one. 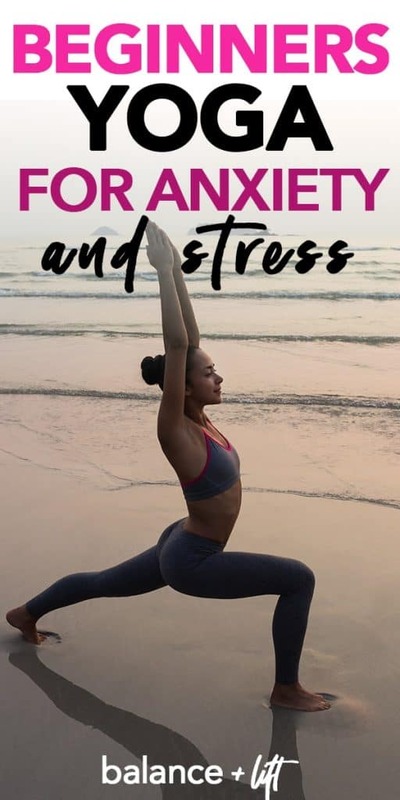 This is a great yoga pose for anxiety because it has such a calming effect on the mind and your body. You can use a strap like in the photo to help you keep your legs straight and in the air. You can use a wall to lay your legs on for the pose. Either option works and they're both really beneficial. The wall is an easier place to relax the mind because you're not having to actively keep your legs completely straight, but the strap method is amazing too. Once you've completed your sequence it's time to start the final posture. If your legs were up against the wall, slide them down and come to lie completely on the floor. If your legs were in the strap, then gently remove them and come to lie down completely on the floor. From the top of your head to the tips of your toes I want you to do a mental check and slowly release any tension you're still holding onto even after your practice. Take a few deep breaths, in the beginning, to help calm your body and mind and then start to breathe normally as you rest. Remain here for 6 minutes. It's ok to set a timer ;). To help you even more here is a wonderful meditation that's specific to anxiety. 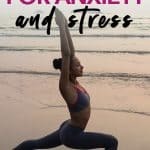 Pairing this meditation along with the yoga for anxiety sequence above will help to relieve stress and anxiety faster than if either was done alone. Adriene's yoga YouTube channel is super popular and really amazing. She has so many different videos for a ton of different things. Give this meditation a shot for about 21 days and keep a journal of your days. There are some other things you can do to help quiet your anxiety and stress on a daily basis, but it really depends on you. It depends on how much stress and anxiety you have in your life and how well you take care of yourself.